Analytical Trilogy is the science that grew out of Dr. Norberto Keppe’s psychoanalytical school of Integral Psychoanalysis. Trilogy signifies the union of the fields of theology, philosophy and science, while Analytical expresses Keppe’s scientific method of client psychoanalysis. Keppe has developed a scientific view of man as fundamentally a healthy and mature entity based on his assertion that the nature of life is good, beautiful and true. His scientific perspective, then, is optimistic and positive as opposed to many traditional psychoanalytical schools that see human reality in pessimistic terms. For Keppe, human dysfunction occurs when the individual deviates from his inner reality and begins to seek fulfillment in something outside his own true nature. Illness is simply the result of a desire (often inconscientized) to deny, omit or distort truth and reality. It is the factors that arise from the individual’s own interior out of the inverted application of his will that cause his or her mental, physical and emotional difficulties, meaning that Keppe has developed the world’s first truly psychological science. Another fundamental aspect of Analytical Trilogy is the application of psychological wisdom to the socio-economic structure. Keppe’s contention is that the greater society has been organized to serve those who pathological crave socioeconomic power. This type of organization, whose laws and philosophy are based on inverted values, is the other cause for mental and physical illness. Note: Currently, we can see that pathological financial power is dominating the political, judiciary, legislative, religious, media powers, and has established the worst dictatorship in recorded history. “Consciousness is a phenomenon that involves a mediation of our feeling and intellect and depends on both to occur —the first (feeling) is the basis of consciousness and the second (intellect) is its manifestation”. According to Keppe, consciousness is connected to ethics. A conscious individual is automatically responsible because when an ethical person perceives his mistakes and wrongdoings he is automatically compelled to correct them. 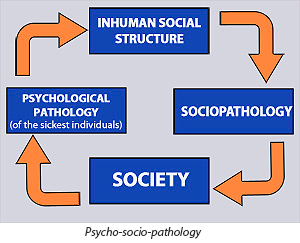 Only a massive conscientization of psycho-socio-pathology will allow humanity to change its destructive path. To better understand these concepts, read the Analytical Trilogy books published by Proton Editora and enjoy the educational TV programs and radio programs available on this site. Those who don’t do anything to impede the destruction of the world are helping to destroy it.